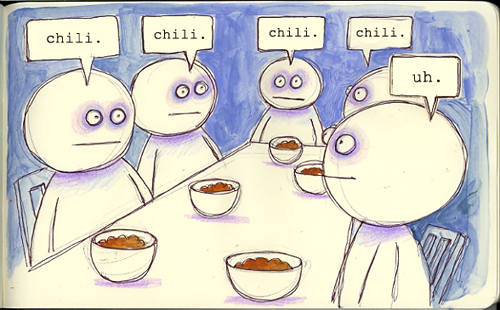 I love chili, and I love Zombies – so this sketch is wonderful to me! Whew…finally finding some sites I can relate to! Thank you, Lauren the Cartoon Goddess. This old coot has recently re-entered the web world and am still stumbling through the tomato patch, but finding fellow artists like yourself keeps me moving on (and hopefully upward – grin). I too find comics and cartoons and off-the-cuff comments and thoughts of the moment my main expressive form of art – and the sketch journals – whether in real books or on my computer – is my medium of choice. Been looking the last few days for like-minded people. Just found your site via blogcatalog a few moments ago. Lot to explore here. And interested in the connections – your blogroll – you have made. Hoping to make similar contacts of my own. This is how I feel when it comes to days upon days of leftovers!